This fall's going to be a big one for progressive rockers Porcupine Tree. They'll be touring the states with Kings X, and return September 22 with their tenth studio offering, 'The Incident,' a double-CD that's perhaps the band's best record since 2002's 'In Absentia.' 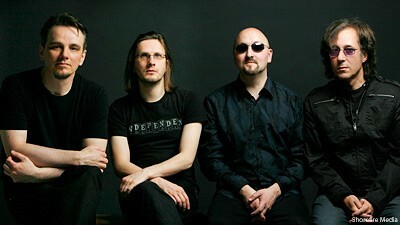 Subtitled 'After This, Things Will Never Be the Same Again,' frontman Steven Wilson says the record is, essentially, "a song cycle. It's 55 minutes long, and it has 14 sections, but it's all continuous. It's quite intense." "To be perfectly honest, I didn't even think I'd be able to write another record so quickly, because I literally came up with this solo album and I finished recording the solo album, and a week later, I was in the studio, trying to write the next Porcupine Tree record," he tells Noisecreep. "But very quickly, something came, and its one of those things were you cannot foresee that or rely on that. But I was very lucky. And I was able to call up the guys a few weeks later, and say, 'Look, I've got 30, 35 minutes of this thing called 'The Incident,' and I think it could be the basis for the new record.' And it just kind of grew from there." What inspired 'The Incident,' initially, was a fatal car accident in the United Kingdom, Wilson's native stomping grounds. As he was driving passed the wreck, he got "a feeling, an impression" that he had come into contact, somehow, with the soul of the person who perished in the crash. "Incident is a very kind of cold word," he says. "I don't know what they say here in America on the highway when there's been an accident, but in England, they put up on the signs 'Incident,' and then you realize, 'Ah f---, now I'm going to get stuck in a traffic jam.' But the incident that they're talking about, someone's died. This is a bit more than an incident. For everyone driving passed, rubbernecking, it's a momentary titillation. But obviously, for the people involved in the accident, it's a life-changing and potentially life-ending experience. So, I just had this little moment of empathy, and I felt a connection with... call it what you want, but a kind of sense that that person was with me at that moment, and that started the whole ball rolling for me." Wilson took the concept, and started applying it to his own life, and the various "incidents" that have shaped who he is as a person. The break-ups, the career moves, the forgotten friendships, and even a séance he participated in as a youth. He started thinking about the media, "and the way people relate to the media and these incredibly tragic incidents, and of course, we all become more and more numb these days to media reportage." 'The Incident' features 14 tracks, including "The Blind House," "Octane Twisted," "I Drive the Hearse," "Circle of Manias," and the first single, "Time Flies." Wilson suggests the record be listened to as a whole, but knows that in the era of the iPod, that's just not going to happen. "In a way, what we're doing here is very willful and self-indulgent," he says. "This record, more than any record before, is a record that you have to listen to as an album-length experience. People don't really listen to records that way anymore. Its very hard to get people to do that." Hence, the very notion of an album single is confounding for Wilson. "When I was writing 'The Incident,' I never thought of anything as a single, and I didn't really think it was an issue anyway, because who listens to radio nowadays," says Wilson. "Its always been the Achilles Heel of Porcupine Tree. We're not the kind of band you can get across in five minutes. Even taking out a portion of 'The Incident' and presenting that to people, is very unrepresentative. We're a band that, one minute we're like heavy metal, the next minute were like pop, the next minute we're ambient, and the next minute, we're progressive. So, how can you expect to encapsulate all those things anyway in a five minute video. So, by definition, anything you take out of context is just an aspect, so people, they can't get a good feel for the band unless they listen to the whole record."